Peter Aigner first studied at the Anton Bruckner-Privatuniversität in Linz, further studies led him to Vienna (University of Music and performinf arts) with Thomas Kakuska (Alban Berg-Quartet). He visited masterclasses with members of "La-Salle-Quartet" and Hatto Beyerle. From 1987 to 1997 principal viola at "symphonic ensemble aktuell" (Franz Welser-Möst), member of Gustav Mahler-Jugendorchester (1989 - 1991) (Claudio Abbado), Lucerne Festival Orchestra (1994) (Sir Yehudi Menuhin). From 1992 to 2013 principal viola of "Orchester Wiener Akademie", leading member of Ensembles like "Ars Antiqua Austria", "Piccolo Concerto Wien", "Armonico tributo Austria" and others. Founding member of OÖ. David-Trio and Quartet Diagonal. Peter Aigner appeared as soloist at Vienna Musikverein, Lausanne Opera, Carinthic Summer, Kalinigrad Organ-Festival, "Prague-Spring-Festival" and many others. Peter Aigner teaches at "OÖ. Landesmusikschulwerk", led masterclasses and workshops at "Anton Bruckner-Privatuniversität", "Musicum Salzburg" and "Tschaikovsky-Conservatory Moscow", furthermore he is a regular jury member of both province and statewide competition "Prima la musca" in Austria". 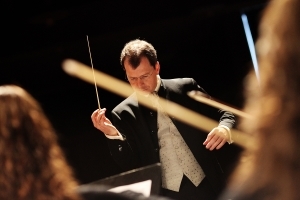 Since 2003 he is conductor of "UAS-UpperAustrianSinfonietta", a youth orchestra of "OÖ. Landesmusikdirektion", (concerts at "Brucknerhaus" Linz since 2007) in 1999 he founded "Ensemble Pro Arte" and since 2007 he curates the "International Chambermusic Festival St. Marien".